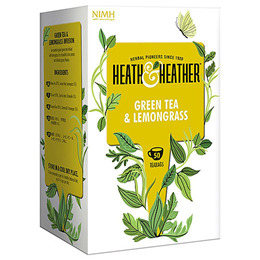 At Heath & Heather, their herbal specialists have combined refreshing green tea with the mild grassy notes of lemongrass and the zestiness of lemon peel to provide a vibrant and flavoursome tea designed to support your wellbeing. Below are reviews of Heath & Heather Green Tea & Lemongrass - 50 Bags by bodykind customers. If you have tried this product we'd love to hear what you think so please leave a review.